Barren Cave is a cave in eastern Cyrodiil, east of Blue Road Keep. It serves as a den for several Bloodfiends and Bloodborn vampires. 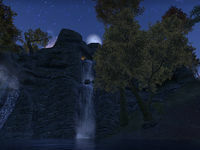 A lorebook, On the Nature of Coldharbour, can be found here. 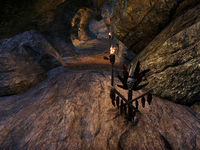 Barren Cave also appeared in Oblivion. The entrance is a bit tricky to locate. Note the glow at the top of the first falls. Approach from the right.